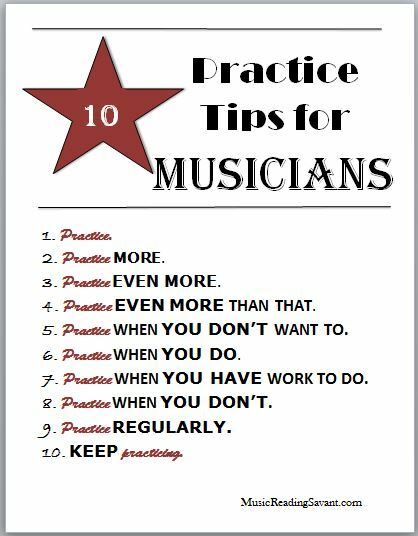 Homework in band involves regular practice outside of class time and everybody knows that “practice makes permanent.” Students are sometimes reluctant to practice or if they do, the time is not spent productively. Below are some insights and suggestions. Our most important goals are musical and technical development. Musical goals: We make music in our heads and then put what’s there through an instrument. If there’s not much happening in our heads, there won’t be much coming out the instrument. So how do we train our brains to be musical – to “think in sound”? Listen to a lot of music – different styles and instruments (but especially your instrument when possible). Think about the music- go beyond notes and rhythms to style, feeling, interpretation, sound, etc. Listen to what more experienced musicians might tell you (teacher, clinicians, etc. Technical development: How can we share the sounds in our heads? How can we recreate those inner sounds with our instruments? A Balanced and Regular Practice Routine – your teacher can advise you on what specific material you should cover. Your band method book and this guide are excellent places to start. School/Lesson Assignments: What do I need to know from day to day? What has been assigned for the next lesson or band class? Upcoming Performances: Am I prepared for the concert? How well do I know my part for this concert? How well do I know what the band or ensemble is trying to create for this concert? How well do I know how my part fits into what the group is doing? Is it melody? Is it background? Do I have to play that same part with other instruments? What do we do when we practice? This will prepare your brain (listening, getting an idea of how you want to sound) and body (embouchure, lungs, fingers, etc.) for what they must do. These are studies which develop your physical ability to play the instrument. They will improve range, speed, flexibility, articulation, etc. Various lines in your band book are dedicated to technical development. What is expected for the next rehearsal? the next concert? Learn your parts! Make sure you can play all the notes, rhythms, articulations, etc. This includes studies in various styles to develop phrasing ideas, interpretation, etc. This can be exercises in the method book or phrasing/interpretation of your band repertoire. Take some time to play music you enjoy, whether it’s for fun or for any other reason. Get together with some friends to play some music of your own choosing. How do we practice effectively? Set up a consistent time and location at home to do your practicing. You must set goals for each practice session.Do you have an idea about how the finished product is going to sound before you begin practicing? Are you trying to improve at each practice session instead of repeating things you can already play? Practicing is like problem solving. Can you break each objective into steps? Think about what you’re doing. What are the problems you are having? Do they involve rhythm? technique? note reading? range? articulation? accuracy? Make a preliminary check of the music before you play. This could include key signatures, note names, fingerings, slide positions, form, musical terms, etc. How do I know my practicing has been effective? Have I taken care of each step? You must have some way of telling yourself you are doing the right things with a piece of music. To practice a piece with mistakes is a waste of time. Make sure that each step is one that you can be pretty sure you have correct, and then you simply string them all together. Get the advice of your teacher or another musician if you’re unsure. Time is short! We never have enough of it so make the most of the time you have. Every practice session should begin with a warm-up and finish with a piece that you sound good on and enjoy playing. This way you always finish your practicing on a positive note. But, a practice session that consists only of a warm-up and a finishing piece is a waste of time as measurable progress does not occur! You must put most of your effort into the activities between the warm-up and finishing piece. Following are some sample practice routines. Try not to use the same routine twice in a row – variety helps keep practice sessions interesting.